This player, dating back to 1991, is very much a "work in progress", so much so, in fact, that it is the first thing Jean-Marc Fontaine points out about it - before going on about all that is wrong with it. However, it is an interesting piece of engineering and has a few unusual features. The arm is a radial Revox arm intended for LPs. It is maneuvered by the three black buttons at the top of the player. Its range of travel is a bit short for cylinders, as they don't always stop in the same position on the mandrel. On this player, this difficulty is overcome by moving the whole arm assembly along the cylinder axis when needed. The arm can be easily raised and lowered by simply turning the large knob on the back of the player in order to take cylinders of diferent diameters. The smaller knob beside it is for fixing the arm. A special is a possibility to swivel the arm, raising one end and lowering the other, using the knob on the right-hand side of the arm assembly. 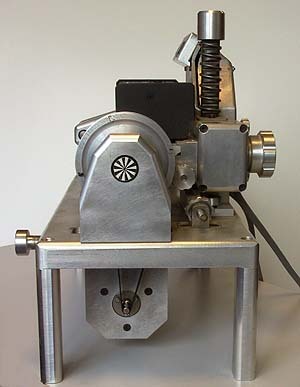 This device is intended for use on cylinders that have a sloping surface or vary in thickness along the stylus path. Adjustments can be made while the cylinder is playing. The pickup used is a Stanton 500, with styli of 188µ (7.4 mil), 107 µ (4,2 mil) and 94 µ (3,7 mil). Stylus pressure is normally kept at about 3 grams. The mandrels are made of PVC and are suspended at both ends. 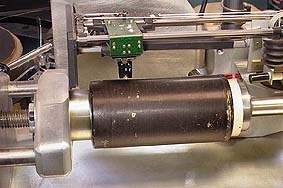 Once the cylinder is in place on the mandrel, it is held by holes in its ends, into which knobs are pushed by turning the large knob on the left-hand side of the mandrel axle. The pressure exerted on the bearings when tightening the mandrel is a problem, as they are not made to sustain axial pressure. The power supply for arm and drive motors are separate, and placed in two boxes. 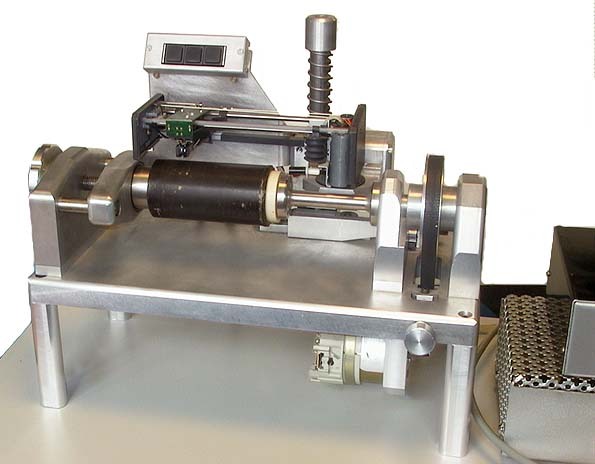 Drive motor speed can be slightly adjusted and is monitored by a stroboscope on the right-hand end of the mandrel axle. The drive belt with its extra pulley for stretching the belt has turned out to be rather noisy, and Jean-Marc Fontaine would also like to place the motor somwhere else to avoid noise reaching the pickup. As for now, the motor is rigidly bolted under the base plate. This prototype player was developed in cooperation with the Bibliothèque nationale de France (the French national library). Both he and the player can be found at LAM (Laboratoire d'Acoustique Musicale) in Paris, an institution doing research in acoustics in a variety of ways: musical instruments, vibrations, concert hall acoustics, the sound environment and the ageing of sound carriers among other things. Rear view with the large knob for raising the arm assembly to the left. The electronics for the Revox arm are behind the large metal cover. Detail of the mandrel with its tightening screw on the left. The bellows for the pneumatic lift mechanism on the Revox arm at right. 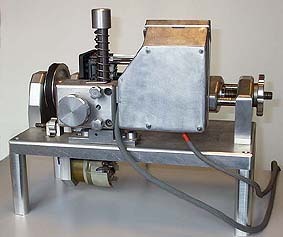 The player seen from the right, with the stroboscope on the end of the mandrel axle. Protruding to the left is the knob for stretching the drive belt.